A study published Thursday details a promising and novel approach to help stop the viruses killing honeybees, which pollinate much of the food we rely on: mushrooms. 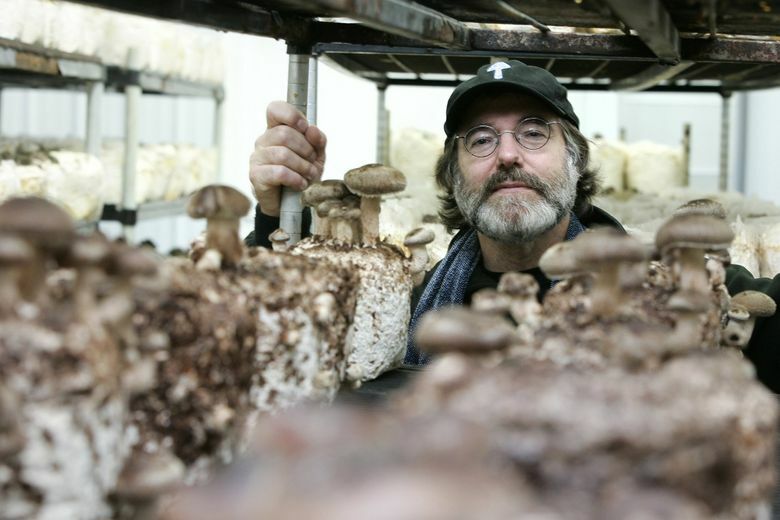 The epiphany that mushrooms could help save the world’s ailing bee colonies struck Paul Stamets while he was in bed. Years ago, in 1984, Stamets had noticed a “continuous convoy of bees” traveling from a patch of mushrooms he was growing and his beehives. The bees actually moved wood chips to access his mushroom’s mycelium, the branching fibers of fungus that look like cobwebs. “I could see them sipping on the droplets oozing from the mycelium,” he said. They were after its sugar, he thought. Decades later, he and a friend began a conversation about bee colony collapse that left Stamets, the owner of a mushroom mercantile, puzzling over a problem. Bees across the world have been disappearing at an alarming rate. Parasites like mites, fast-spreading viruses, agricultural chemicals and lack of forage area have stressed and threatened wild and commercial bees alike. Waking up one morning, “I connected the dots,” he said. “Mycelium have sugars and antiviral properties,” he said. What if it wasn’t just sugar that was useful to those mushroom-suckling bees so long ago? In research published Thursday in the journal Scientific Reports, Stamets turned intuition into reality. The paper describes how bees given a small amount of his mushroom mycelia extract exhibited remarkable reductions in the presence of viruses associated with parasitic mites that have been attacking, and infecting, bee colonies for decades. In the late 1980s, tiny Varroa mites began to spread through bee colonies in the United States. The mites — which are parasites and can infect bees with viruses — proliferate easily and cause colony collapse in just years. Over time, colonies have become even more susceptible, and viruses became among the chief threats to the important pollinators for crops on which people rely. He likened the mites to dirty hypodermic needles; the mites are able to spread viruses from bee to bee. Stamet’s idea about bee-helping mycelium could give beekeepers a powerful new weapon. At first, mushrooms were a hard sell. When Stamets, whose fascination with fungi began with “magic mushrooms” when he was a “long-haired hippie” undergraduate at The Evergreen State College, began reaching out to scientists, some laughed him off. When Steve Sheppard, a Washington State University entomology professor, received a call in 2014 from Stamets, however, he didn’t balk. He listened. Sheppard has heard a lot of wild ideas to save bees over the years, like harnessing static electricity to stick bees with little balls of Styrofoam coated in mite-killing chemicals. Stamets’ pitch was different: He had data to back up his claims about mycelium’s antiviral properties and his company, Fungi Perfecti, could produce it in bulk. “I had a compelling reason to look further,” Sheppard said. Together with other researchers, the unlikely pair have produced research that opens promising and previously unknown doors in the fight to keep bee colonies from collapsing. To test Stamets’ theory, the researchers conducted two experiments: They separated two groups of mite-exposed bees into cages, feeding one group sugar syrup with a mushroom-based additive and the other, syrup without the additive. They also field-tested the extract in small, working bee colonies near WSU. For several virus strains, the extract “reduced the virus to almost nothing,” said Brandon Hopkins, a WSU assistant research professor, another author of the paper. The promising results have opened the door to new inquiries. Researchers are still trying to figure out how the mushroom extract works. The compound could be boosting bees’ immune systems, making them more resistant to the virus. Or, the compound could be targeting the viruses themselves. “We don’t know what’s happening to cause the reduction. That’s sort of our next step,” Sheppard said. Because the extract can be added to syrups commercial beekeepers commonly use, researchers say the extract could be a practical solution that could scale quickly. For now, they are conducting more research. On Wednesday, Hopkins and Sheppard spent the day setting up experiments at more than 300 commercial colonies in Oregon. Meanwhile, Stamets has designed a 3D-printable feeder that delivers mycelia extract to wild bees. He plans to launch the product, and an extract-subscription service next year, to the public. Stamets said he hopes his fungus extract can forestall the crisis of a world without many of its creatures, including bees. He is alarmed at how fast species are going extinct. “The loss of biodiversity has ramifications that reverberate throughout the food web,” he said, likening each species to parts of an airplane, that hold the earth together — until they don’t.